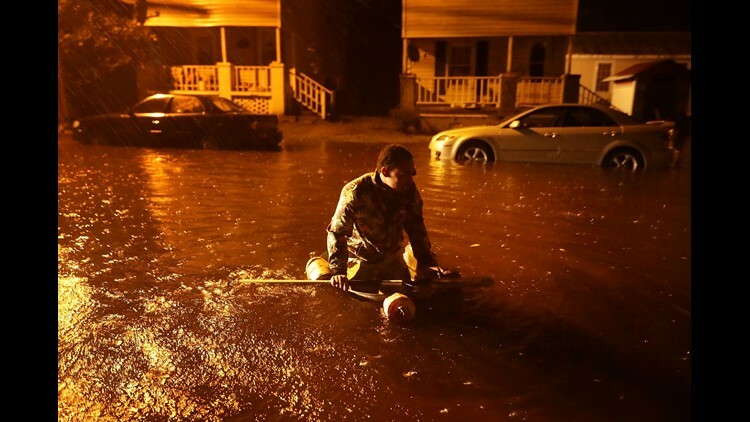 NEW BERN, N.C. – New Bern, the city on the North Carolina coast where the Neuse River and Trent River intersect, was reeling Friday after being inundated from flooding caused by Hurricane Florence. At least 150 people are still waiting to be rescued from the attics and rooftops of their homes as of 1 p.m. Friday, said New Bern Mayor Dana Outlaw, whose adult daughter had 1 foot of water in her own home, he said. Outlaw said at least 4,200 homes and 300 businesses in New Bern have sustained damage from flooding or trees. He said that only 300 of the city's 22,000 residents have power as of Friday afternoon. The City of New Bern said in a tweet before dawn Friday that there were about 150 people who still needed swift-water rescue. New Bern is about 32 miles north of Morehead City, North Carolina, and 101 miles southeast of Raleigh. Outlaw said that number remains unchanged. "What happens is that we rescue some people and then we find out there are still more who need it," he said. "People who live in New Bern have experienced hurricanes before, but it has been a long time since we have experienced something like this." “We’re estimating we’ve rescued 150-200,” New Bern Police Lt. David Daniels said early Friday morning. Authorities advised residents who had not evacuated to go to the highest point in their homes, call 911 for help, keep their cell batteries charged as best they can and wait for help to arrive. Tom Ballance said his wife went to Atlanta and he stayed behind in their New Bern home with their three dogs and a cat. At around 3:30 p.m. Thursday, the electricity went out. By midnight, his rain gauge showed that he'd gotten 9 inches of rain since mid-afternoon. He drifted off to sleep. About 40 minutes later, he woke and went to a sun room, where he'd boarded up all the windows except for a small hole. He shone a flashlight through the glass. "I about jumped out of my skin," he told The Associated Press in a telephone interview Friday morning. "These were waves crashing down." The Neuse River is about 25 feet away, and downhill from Ballance's house. He decided that if the water reached the house, he'd take the pets to the second floor. "The water kept rising and kept rising," he said. The water never made it to his home. The city of New Bern issued a curfew Friday morning, effective from 7 a.m. Friday to 7 a.m. Saturday "upon any public street, alley or roadway or upon public property." The National Weather Service office in Newport, North Carolina, in a tweet called the storm surge "catastrophic." The weather service later measured a storm surge 10 feet deep in the city. A US Geological Service gauge for the Trent River in New Bern was "recording 10.1 feet of inundation" as of 1 a.m. Hours before the storm made landfall Friday, workers at New Bern's WCTI-TV had to abandon their studio because of flooding. "Storm surge values continue to rise in areas of onshore flow on the North Carolina coast and over inland waterways. A USGS gauge in Emerald Isle, North Carolina, recently recorded 6.3 feet of inundation." The center of Florence is forecast to move further inland across southeastern North Carolina and eastern South Carolina through Saturday. The storm will then turn northward across western North Carolina and the central Appalachian Mountains early next week. New Bern, the city where Pepsi was invented in a drugstore, was still experiencing winds in the 70 mph range Friday afternoon. "We aren't going to try to restore power for quite some time, probably," Outlaw, the mayor, said. "You don't want to put someone in a bucket and send them high into the air to mess with power lines in 70 mph winds." No deaths have been reported in New Bern, but the situation caused by Hurricane Florence is dire, the mayor said.